NYC, 02/21/2019, 7:00PM. 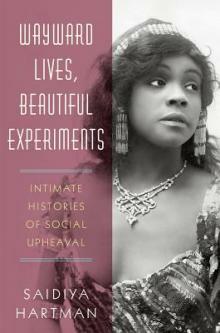 Wayward Lives, Beautiful Experiments: Intimate Histories of Social Upheaval. Saidiya Hartman examines the revolution of black intimate life that unfolded in Philadelphia and New York at the beginning of the twentieth century. Free love, common-law and transient marriages, serial partners, cohabitation outside of wedlock, queer relations, and single motherhood were among the sweeping changes that altered the character of everyday life and challenged traditional Victorian beliefs about courtship, love, and marriage. Hartman narrates the story of this radical social transformation against the grain of the prevailing century-old argument about the crisis of the black family. Saidiya Hartman is a Guggenheim Fellow and author of Lose Your Mother: A Journey Along the Atlantic Slave Route and Scenes of Subjection. She has been a Cullman Fellow and Fulbright Scholar. She is a professor at Columbia University, and lives in New York.